Adjusting specific colours in an image. There is a really quick way to address adjusting specific colours in an image without the need to make a selection around it. As always there are many ways to tackle any issue in an image using Photoshop and this is a simple and easy to follow method. When photographing people you may need to alter the skin tones, make the sky more saturated or pull out some saturation from a garment. All this can be done without the need to make a selection around that area. In this image the model is wearing a bright red dress and the sky behind her is not very saturated. We can alter the colour of the dress and give the sky more impact by adjusting each specific colour. The principal is that there is no blue in her dress so if I increase the saturation of blue only her dress will remain unaffected. Also if I adjust the red then the sky will be unaffected. So no need to spend a great deal of time making a selection around the model, we can adjust the image and separate it in our minds using colour. Lets look at a simple approach to this using Image < Adjustments < Hue/Saturation. 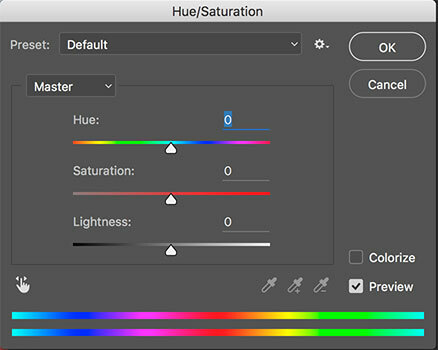 Open any image you would like to try this out with and then follow the drop down menu to bring up the Hue and Saturation adjustment dialogue window. Where you see the word Master, this is where you click to find all the different colours in the image that you can adjust. Click there and choose one colour that is in your image that you want to alter. In the below video this is demonstrated. Another fun thing to try is to alter the Hue slider bar. This will alter the actual colours in the image not just the cloud saturation. So if you have a blue sky and want to make it golden like a sunrise or sunset then you can adjust the hue as well as the saturation. its to explore and discover in this simple yet powerful method of adjusting. Remember to use adjustment layers if you would like to try this technique non-destructively. 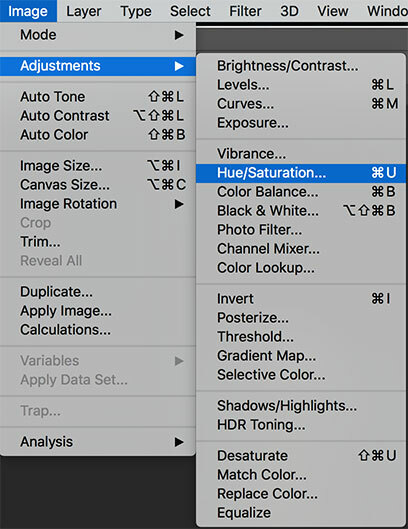 Follow this link to learn more about adjustment layers.